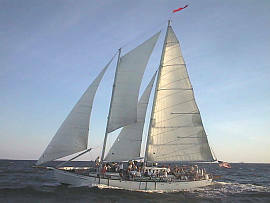 Running Free Inc. http://www.schoonerwoodwind.com based in Annapolis, MD, operates the 74-ft., Schooner Woodwind and Woodwind II and invites applications for the post of crew/deckhand. Fun people, great (and fast) sailing schooners, terrific location, and good money! We primarily do daysails and private, corporate charters with many teambuilding events including fun, match races between our two schooners. Some sailing experience necessary. Avg. $12/hour, FT & PT. Immeadiate positions are open and will be filled throughout mid-May. Perfect candidates will be able to work through October. This is not a live aboard position. Some winter maintenance work is available for right candidate.